The fact is that we all have some stories to tell-be it about the restaurant that you visited last week or interesting people you came across in the saturday-night-party. 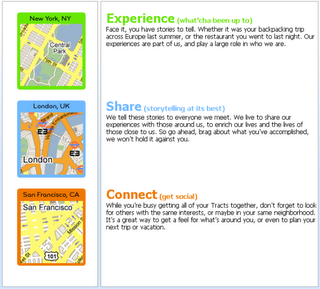 What if you could put these interesting stories on the map and share with the your friends? geoTract : marries the Google map APIs (gMaps) and the very concept of social networking – i.e. sharing stories! User stories/experiences are plotted on gMaps (allows the placement of markers based on coordinate systems). Once a marker has been placed, users can then share that information with the world, or maybe just their friends and relatives. If implemented well, this can be very useful tool for travellers as well as those who are looking for reviews on places/restaurants etc. I spent close to 20 minutes on the site, but couldn’t get to read any of the user reviews/blogs. Somehow none of the places have been blogged about – means no. of users are too less to make it a success. Also, the site allows one to search only on “what” and “where” only. Maybe geoTract need to expand/bring contextual forums for the travellers.